In our previous post we looked at how Manage File Tools (MFT) have become useful alternatives to send files compared to FTP and email applications. In this article we shall look at how PDF Courier can guarantee the delivery of your important documents and how it can prevent your attachments from being blocked by email Spam filters. Over the years, Spam emails have dramatically increased. This is due to the proliferation of private and corporate personal information online. The result, are individuals unnecessarily and aggressively targeted by unsolicited emails, usually from unknown sources. As a result, many legitimate emails never make it to their intended destinations, either because they are inadvertently blocked by Spam filters or because recipients overlooked them. It’s true that there are “email acknowledgment” features senders can use to illicit reception, but often, these features are ignored by document receivers. In addition, emails with attachments are especially prone to being excluded by Spam filters. Most email servers today are configured to scrutinize anything that looks suspicious. Whereas years ago executables and unfamiliar file extensions were the prime targets, today’s blocked attachments include images, PDFs, and even common file formats. By contrast PDF Courier features three different options that individuals can use to send their documents without email server restraints: A Web-based interface, a standalone desktop application, and a Microsoft Outlook® plug-in. All three share the same functionalities and all three have secure, guaranteed delivery capabilities to bypass email Spam filters. 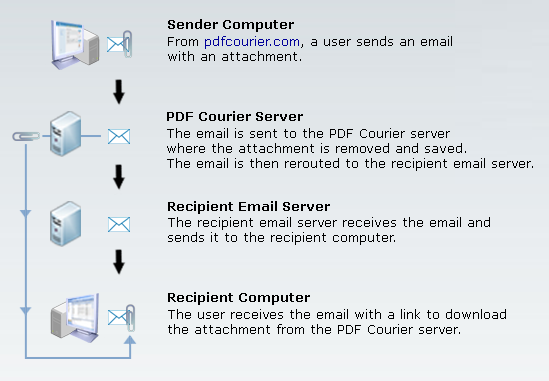 For example, when a user sends an email with an attachment (Figure 1) using the Web interface, PDF Courier will remove and temporarily keep an email’s attachment. The recipient will then receive the email and a prompt to go safely download the attachment from PDF Courier. Once the attachment has been downloaded the sender gets a notification message from PDF Courier to inform them of a successful reception. In an upcoming post, we shall see how the PDF Courier’s Web easy-to-use functionalities can also be integrated directly into Microsoft Outlook. Sending files to and from organizations is part of our corporate communication. What originally began decades ago as simple file transfers between research and government campuses, has become part of business interactions around the world. FTP was the original workhorse that enabled us to send files, but as network capacities grew, so did our need to send larger and larger files. Soon FTP carried complex documents, large images, and even multimedia. As a result, file transferring softwares and email applications became popular alternatives to FTP, but their popularity also came with a price. Security issues similar to those that plagued FTP often found their way into many file transferring softwares. And even though email applications were more secure than their file transferring counterparts, they too experienced problems, especially concerning privacy. It wasn’t long before software developers recognized the need to provide end-users with tools that functioned like FTP, (but with better security) and also included notification options commonly found in email applications. The answer became what is known today as File Transfer (MFT) tools. MFT tools refer to a family of applications that enable end-users to send, track, and manage file transfers in and out of organizations. Amyuni Technologies recognized the benefit of MFT tools and as a result, developed the PDF Courier; a simple and secure MFT tool to help users send and track their documents. With just a few options and configurations, the PDF Courier keeps file transfers simple without compromising security. Guarantee the delivery of your important documents and emails. Prevent your documents and attachments from being blocked by email SPAM filters. Convert your documents into PDF prior to being sent. Track your documents and make sure they are delivered and read using real-time status notifications. Transfer and store large files and avoid the storage limitations often imposed by many email applications. Preview your sent and stored documents online, without the need to download them. Work directly from your Microsoft Outlook® application.